What a weird title for a podcast episode you think. Actually, nothing could be further from the truth. Ian and I have worked together in two lives. In 2007 I took a sabbatical to go do hush hush secret stuff in the government space for a major vendor and met Ian and gelled immediately. We’ve worked together ever since and when I joined Red Hat I brought him in soon after. This is a coup because after a life spent in the shadows talking common sense doctrine to governments and people in positions of authority Ian is actually on the record and talking Open Source. To say he was outside his comfort zone is an understatement but it was lovely to have the chance to open a door sensibly and only talk about stuff which doesn’t see us carted off to jail for breaching each of our obligations as signataries of Her Majesty’s Official Secrets Act. Ian had always worked in the proprietary rather sheltered world of data intelligence and manipulation. He definitely wasn’t a Linux user – at all, in fact I gave him his first Linux laptop. He didn’t get Open Source as nobody had ever explained or shown him, didn’t know Open Shift or how to even install Red Hat. A hugely talented versatile developer with a brain the size of a family car and the ability to hold a room in his hand he has become one of the most important hires Red Hat UK has ever made. Ian, now immersed in Open Source was reborn, reborn with a new verve or vigour and is now truly Mr Red Hat when you put him in front of customers and with his almost unrivalled abilities with the understanding of data storage and data manipulation in the European space is always in demand to help bring projects to conception. He was nervous as hell recording this, don’t know why – he’s the mac daddy when it comes to big data even if he does hate the term. We talk OpenShift, OpenStack, we pour scorn on some and heap praise on others. A very enjoyable recording session. 2) If you’re considering a change in career and want to understand the passion that drives Red Hatters to go to work – then this is for you. I was at the Gluster London Community event in London yesterday and listened to speakers there talk about Gluster and demystifying what it is and also how it has made an impact in the storage world. One of the speakers there was Udo Seidel from Amadeus in Munich who is well known in Open Source circles and a great guy to talk tech to. We meant to record this in Edinburgh as he was also at Linuxcon but time ran out. So we reconvened and yesterday we put this ten minute podcast together for you. Come back next week for some more great content. Remember you can subscribe to the show via iTunes on your iOS or MacOS device of choice or any platform via the RSS or my syndicated feeds. This weekends podcast talks about my thoughts around Linuxcon, I also put front and centre my thoughts about our responsibilities in the Open Source world. Big thanks to Jim Zemlin, Stephanie Markowski and Jennifer Cloer for their hard work and diligence to help make Linuxcon such a success and inviting me there to podcast. As a card carrying paid up member of the Linux Foundation getting those podcasts recorded as professionally as possible and to draw attention to what Linux and Open Source is about is crucial. In the past few weeks I’ve podcast about, and talked about the Gluster Community Day this coming Tuesday in Shoreditch, London. A free event starting at 2pm till 6pm, lots of great speakers, demos and lots more. I’m podcasting from there so if you fancy being on a show get down there and say hi. More information from the Gluster Community Page, and register via Eventbrite here. If you’re into Openstack, storage, cloud, open source then this event is especially for you. Now go listen to the podcast – this one’s just me talking but it’s a call to arms and important. 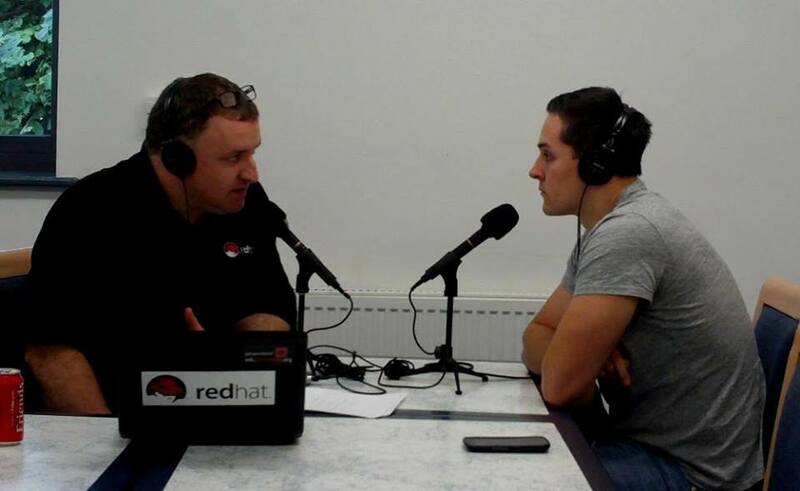 This weeks podcast is with Klaus Oxdal of Red Hat Nordics. Klaus is a good friend of mine who I’ve worked closely with for 3 1/2 years or so and he eats lives and breathes Red Hat. 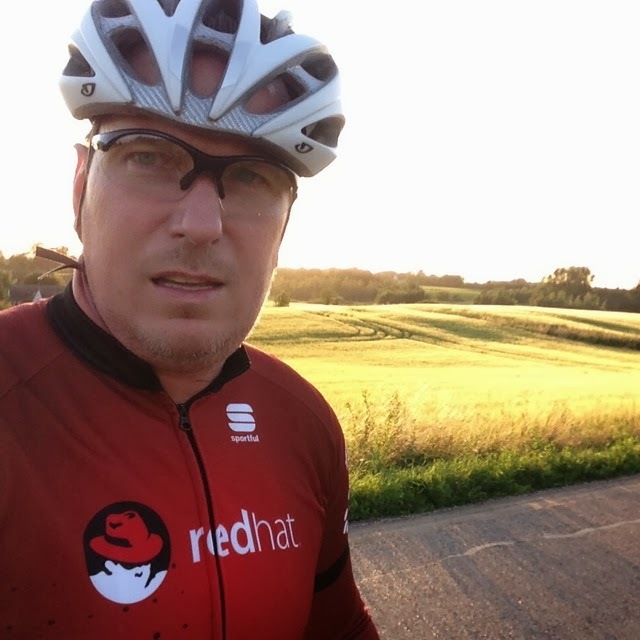 Much like my erstwhile American/Dutch TechGod colleague Eric Schabell he is one of the Red Hat EMEA cyclists spending a lot of time in Red Hat colours on the roads of Denmark. Only this time he’s going one better. Klaus is part of a team cycling from Denmark to Paris, France culminating in a sprint finish to the Eiffel Tower. It’s all for a good event it’s for a Children’s Cancer Charity. It’s a mammoth distance, it’s a mammoth effort and I thought we’d tag onto the end of our conversation an invitation for people to find whatever they could afford to make a difference in treating childhood cancers. An amazing cause that deserves our support. I’ve stumped up cash as a parent of two children and I’d like to think we can help raise them some funds. You can read more on their sponsorship page here, go visit it now !! In the podcast I also talk about Gluster.org the upstream of Red Hat Storage having a workshop at LinuxCon Europe (where I will be attending and doing the show podcast) and speaking with the likes of my shadow and compadre from Gluster.org / Red Hat John Mark Walker pictured with me above. The day is WELL WORTH ATTENDING if you’re going to LinuxCon or even if you’re not. The workshop starts at a very reasonable 10 a.m. This full-day, free workshop includes talks on using Gluster with OpenStack, KVM/QEMU, and how to develop apps to integrate with GlusterFS. This is a chance for developers and admins to learn first-hand what GlusterFS and related open software-defined storage projects in the Gluster Community can accomplish in cloud and virtualized environments. Please join us on October 24th at the Sheraton next to the Edinburgh International Conference Centre. Registration for the Gluster Workshop is free, sign up today on the LinuxCon/CloudOpen sign-up page. Note: Choose the “Speaker” registration and use the code GLUSEU13 if you’re not registering / registered for the rest of the conference. In previous podcasts we’ve talked about the cancellation of the London Community Day, well it’s all back on and taking place in London in Hoxton on 29th October. Again I am attending with podcast mic in hand ! There is a stellar cast of speakers and breakouts and you can register either by meetup.com or Eventbrite. I will be there and I look forward to seeing as many of you as possible. Now go download the podcast. Please. I’m asking nicely. Apologies it’s taken so long to get the latest content online. The two recorded podcasts I had scheduled had to be dropped because of content issues / legal issues and having been on paternity leave and then conference travel time has got the better of me. Yesterday we made up for it, Rhys Oxenham has a new role at Red Hat that we want to get out there and talk about and also there is a lot of cool stuff happening in OpenStack aligned with milestone 3 of Havana and open hybrid cloud in general. The podcasts we recorded, the first we’re bringing you this week, the second one next Wednesday, however there is a break with tradition. If you’ve ever wondered how we do these podcasts especially on the road, I’ve made a video for you of the podcast which you can stream below. Enjoy and come back next week for another show and some great articles. Download the podcast in MP3 format here – or alternatively browse the RSS or use iTunes. If you’re into Cloud and virtualisation you can’t fail to have noticed that VMWorld is in full flow and heading into it’s final throes at the Moscone Centre in San Francisco. We’ve made several announcements there mainly around OpenStack certification and training and also CloudForms which has been a puller to the booth (come see our team at Booth 522). I recorded a podcast last week with Bryan Che, which is indexed below which talks about CloudForms and VMWorld and I am supplementing it with a show I recorded midweek this week. In the show I also talk about the London Gluster Community day happening at London SouthBank University on September 10th. I mention in the podcast a link to the Eventbrite registration page which you can find here. I will be there, podcasting, so you could even end up on a show if you come along. I’ll be doing more podcasts on the event in the run up with John Mark Walker so keep your ears peeled. So far we have the following line up for the day itself. 5:00pm – 6:00pm – Free-as-in-beer happy hour! Thanks to John Hardy of Red Hat Cloud BU for the photo above which he sent me overnight taken at the booth, showing lots of VMWorld attendees wearing their Red Hat caps. Got to love a bit of skunk marketing. This is a totally kickass podcast. If you don’t download and listen you’re missing a trick. John Mark and I sat down and talked Gluster 3.4, Cloud, virtualisation, Samba, storage, community – putting the world to rights with a microphone. Now heres why you should NOT miss this podcast, this is two old men of Open Source who have been doing this for about as long as the term Open Source has been coined. Every podcast we do gets thousands of downloads and always gets favourable re-tweets. We have a LOT of fun whenever we record together and I am sure this comes across with the intensity of the discussions that we then lay down for broadcast. 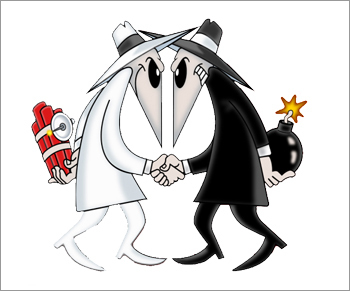 John Mark and I are the two original “Grumpy Old Men” of the Linux community who are both equally passionate about the cause and the entire success of the Open Source movement. This is a slightly longer podcast than we’d usually release however it’s also one of the most important I’ve broadcast. Remember if you listen via iTunes or Stitcher – SUBSCRIBE – if you like the podcast – tell people, tweet it, spread the word. I record this stuff for you and I know judging by the feedback and the download figures that the message IS getting out. Download and listen now. Hope the enjoyment we had recording this comes across and is both informative as well putting a smile on the face of even the most earnest techie / geek.